Q. When and where is the event? A. 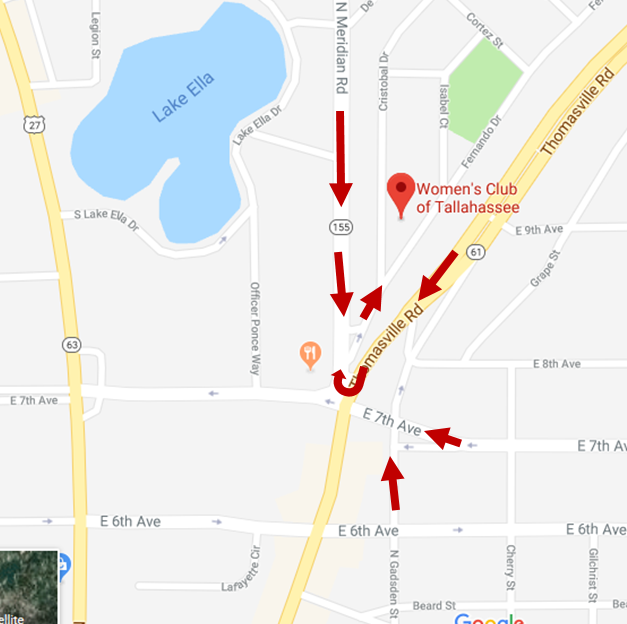 The evening of Saturday, February 23, 2019, at the Woman’s Club of Tallahassee (1513 Cristobal Drive, 32303). Free parking is available at the Woman’s Club, and attendants will be on-site to direct parking. Below is a map showing which roads you can take. The Club entrance is off N. Meridian Road. Drivers heading North on Thomasville Road are not allowed to turn onto Meridian. Q. Why do we need to raise money for the school? A. Cornerstone is dedicated to making our school accessible to as many students from as many different backgrounds as possible. The funds raised at last year’s spring fundraiser helped support the 27% of CLC’s students that receive need-based financial assistance – students that would not have been able to attend without the generous support of our sponsors, donors, and attendees. 100% of the proceeds directly support the financial assistance and academic enrichment programs at CLC. Q. What is the spring fundraiser like? What should I expect? A. It is a party where you have the opportunity to bid on donated items either silently or during a live auction. In both the live auction and the silent auction, if you have the highest bid when the auction ends, you win the item. Q. What is the casino part of the event? A. The event will include casino gaming tables, including blackjack, poker, craps, and roulette! Guests will receive an allotment of casino “play” money, which can be exchanged for casino chips. If you run out of casino chips, we’ll have additional play money available for a suggested donation. Don’t know how to play? Don’t worry! The gaming tables will be staffed with dealers who will be happy to teach you! Q. If I go to the event, will I be expected to bid on items and/or play casino games? A. No! All are welcome to simply come and enjoy a night out with good company. You can visit with friends, enjoy good food, have fun watching others game and bid, and/or volunteer. Q. How do I get an item donated or a sponsorship sold? You (or someone you know) might own a company that would be willing to donate an item or service or become a sponsor. You can ask for a donation from someone you give business to. For example, the next time you get your haircut ask your stylist if he/she would like to donate a haircut or become a sponsor. If you give them business, they are very likely to give you something in return. Q. What else could I do to help with the spring fundraiser? A. There are lots of ways to help! It’s never too late to sign up to be a volunteer. Send your request to springfundraiser@cornerstonelc.com and someone from the fundraiser committee will then contact you. Q. If I’m uncomfortable asking for a donated item should I purchase it? A. We appreciate your consideration, but donating money would be more beneficial to our cause. Q. What do I do with donated items? A. When you or someone you know agrees to donate an item, please email springfundraiser@cornerstonelc.com. Donations may be dropped off at the CLC Office. Q. Is the event just for Cornerstone parents? A. No! Grandparents, neighbors, friends, co-workers, book club members, etc., are welcome to come with you. However, the event is not set up for children, so don’t forget to line up your sitter! Q. Is there a minimum age requirement to attend the event? A. Yes! All attendees must be 21 years of age or older at the time of the event. Please have your photo ID ready upon event check-in. *If you would like to donate something like the use of your beach house, you are welcome to put a restriction on that use if needed, for example, not available for holidays. Q. If I need more information, whom may I contact? A. springfundraiser@cornerstonelc.com or the CLC Office at (850) 386-5550.